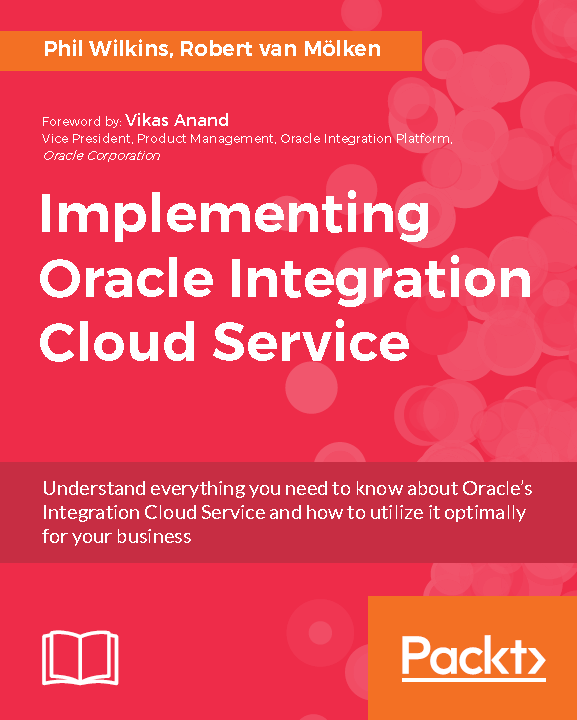 The book Implementing Oracle Integration Cloud Service is written by the authors Robert van Mölken (Oracle ACE) and Phil Wilkins (Oracle ACE Associate). Robert lives in Utrecht, the Netherlands and is a Fusion Middleware specialist. He has over 9 years of experience in IT. Robert studied Computer Science at the University of Applied Sciences in Utrecht and received his BCS in 2007. Before his graduation he started as a graphical designer and web developer, but soon shifted his focus on Fusion Middleware. His career started just before the release of Oracle SOA suite 10gR3 and progressed heavily from there. Currently Robert is one of the expertise leads on Integration and Cloud at AMIS. Before he started working at AMIS he already had 4 years of experience in SOA Suite 10g and 11g. AMIS is specialised at most of the facets of the Oracle Red Stack and is initiator of the Red Expert Alliance, a group of well-known Oracle partners. His main emphasis is on building service-oriented business processes using SOA Suite 12c, but lately his focus is shifting towards Cloud and On-Premises integrations. Using the Oracle Offerings and custom JEE solutions. Robert is a speaker at (international) conferences and is a frequent blogger on the AMIS Technology blog, the Oracle Technology Network, and participates in OTN ArchBeat Podcasts. Robert one of the two SOA/BPM SIG leads for the Dutch Oracle User Group (OGh) and organizes these meetups. He works closely with the SOA Oracle Product Management team by participating in the Beta programs. In 2016, Robert was named Oracle ACE, promoted from ACE Associate, for SOA and Middleware because of these contributions. Phil has spent over 25 years in the software industry with a breadth of experience in different businesses and environments from multinationals to software startups and customer organizations. He started out as a developer on real-time mission critical solutions and has worked his way up through technical and development leadership roles primarily in Java based environments. He now works as an Enterprise Integration Architect for global optical healthcare provider using a range of Oracle technologies and applications as well as specialist non-Oracle cloud and on-premise solutions. Outside of his work commitments, he has contributed his technical capabilities to supporting others in a wide range of activities from the development of community websites, to providing input and support to the development of technical books (particularly with Packt Publishing), and software ideas and businesses. He has also had a number of articles published in technical journals in his own right as well as being an active blogger. Phil is also an active member of the Oracle community contributing particularly to the UK Oracle User Group in a number of ways including presenting at various events. As a result Phil has been recognized as an Oracle Ace Associate. When not immersed in work and technology, he spends his down time pursuing his passion for music and time with his wife and two boys.